I am having ongoing cable problems, even with brand new buckles. I'd first like to know how often other people go through cables? How many hours of use? Do you wait until they are frayed or just replace them. (just curious) How many frayed stands (if any) will you let slide before you replace them? Where do your cables first show frays? above the crimps? Where the cable wraps for size, or right in the center of the cable, where it touches the buckle? Well, my cables just don't last more than 8 hours in the saddle before they are useless. They usually fray one stand in several places, but almost all are above the crimp and where you wrap it for sizes. I also always have a frayed strand where the buckle is, right in the middle. I'll tolerate one or two frayed stands and get another few hours out of the cable, if I'm lucky. Even on and brand new pair of boots, I have frayed cables after two short break in rides!! i first blamed this on the old buckles style, so I took a file and smoothed the edges. No luck. The boots were old anyway, I traded them in. The new boots and buckles were used on the beach for one week, then both buckles AND cables were trashed! Broken pieces off one buckle, and deep dings and grooves on the others. I'm saving these to return to Easycare. I think salt water did these no favors. Now I have completely new buckles to replace the salt water damaged ones. After just four hours on a ride and both wires are damaged! Both in the center where it goes through the buckle grooves, two broken stands. I had no replacements for a four hour ride today. (I'm a pleasure rider, not endurance) I covered the frays with duct tape and hoped they would not get worse. The tape slipped on one boot and ny the time I returned, there were only two strands somehow holding the wire together still. This i 8 hours in brand new buckles and wires??! Te other boot that the tape stayed on now has four broken strands right where it beds around the sizing fork. ?name for this? It won't last any longer either. My two back boots, only used for rides over 2 hours, are frayed one strand each in the smae location. Does anyone else out there have problems like this??? My old generation buckles didn't do this to me, just these new ones. The old ones just bent sideways when I stepped on them to close the front. Does anyone know why this could be happening? How to stop it? Cables themselves are cheap, but shipping is more than the cables! All my spare cables are used up, now I'm stuck waiting one month for new ones and more spares. My horse is helpless without those front boots, and this keeps happening. Advice welcome. I have to wait until Monday to order new cables. Meanwhile, I'd like to not have this happen anymore, What a pain! Well, had been using the nylon stockings for our training rides for a while with some fairly good luck, so I figured it was time to try them on an actual ride. I have been doubling up on them, using a pair on each leg, and it seemed to working well on the training rides, like I said. Unfortunately , they did not work to well on the actual ride. After the first loop Fortune had rubs on all four pasterns, the front legs actually down to the point of bleeding. I removed the boots and stockings and replaced them with vet wrap and we completed the ride with no more problems. I am at a loss as to what to use to not get rubs. I have been experimenting with some different fabrics and making "socks" out of them but have not really found anything I like except for the some really thin neoprene. The first pair I had made didn't fit her (made them too small) so I'm having another set made. My idea is to have them cover from the coronary band all the way up to ankle and be able to fold them over the velco on the gaiter. I do not have any trouble with her heel bulbs or anything esle being rubbed just her pasterns from the gaiters. I think the neoprene will work if I can get it to the size where I can pull it up over her hoof like a sock. I would like it to be a one piece construction. I thought about velcro but decided against it. The neoprene I'm using is 2mm thick which is very thin and I have also found a place that sells "breathable" neoprene which might be even more worth looking into if these "socks" work as I'm am a bit reluctant to use neoprene in the heat, but again, it is covering a small area and the gaiters are neoprene as well so it may not be an issue. I had it stitched top and bottom to keep the neoprene from tearing but did not use elastic thread which the lady who is making these for said I can get and would probably help. When I did try to stretch it over Fortunes foot the thread broke (didn't help being too small either) but it did stretch quiute a bit before that happened so something learned in making each of things. I hope to have newer ones this week to try. I'll keep ya'll posted. Epics make chasing cows fun! I just got back from 3 consecutive days of gathering cows on terrain that varied from sandy washes to sticky clay-like mud, to rocky tundra and everything in-between. Let me tell you, My Epics kept my horses' feet safe and sound, with nary a rub or sore spot. I booted all 4 the first day, then just booted his fronts on the last 2 days. I guess I got pretty lucky with the fit. The modifications I used were, I cut out the back strap, inserted dome pads, made some duct tape bulb protectors, and also used knee-high nylons to sort of keep everything together. I believe the nylons also help the boots to slide on easier. I also used cotter pins through the second hole of the buckle, just in case. We covered alot of ground in those 3 days, lots of steep ups and downs and narly, thick, chest-high brush and those boots endured the whole adventure quite well. I was amused by the smart remarks from the other cowboys about my horse wearing "slippers" or "sneakers", especially at the end of the day when a few or their horses came up with stone bruises and lost steel shoes. My horse was still full of energy and giddy-up, and never took a bad step. My horse is living proof that once you find the right combination of fit, pads and customization technique, you can go anywhere with them safely and comfortably. Best boots for beach runs? I would like to hear people's opinions on their favorite boots (and why) for a week holiday of sandy beach riding. My horse won't tolerate bare front feet for any trail riding (he'd ouch on a tiny seashell), but backs can go either way. I usually have Epics for all 4, but the front are worn and still with winter studs until I decide what to try next. I'm looking at using my studs, grips, Old Macs G1, or more Epics for this trip. How is the traction of plain Epics or the possibility of sand collecting in the Old Macs and rubbing his coronets and pasterns raw? Too much traction? Too little? Here is a great article written by Team Easyboot member Jenny Moncour. It is called "Tips and Tricks for Booting", and has a lot of great information and helpful advice in it. Thanks Jenny!....and thank you to the others that are also in the article, Kylie, Rachel and Duncan. You guys rock! If anybody else has any articles that they would like to share, please do so - you can insert them similar to how a photo is inserted. Use the icon called "Insert File" that looks like a page with a little green arrow. If you need help let me know, or send it to me and I can post it. If any of you are interested in writing an article on using EasyCare hoof boots and need information, graphics or encouragement feel free to email or call me any time! 1-800-447-8836 ext. 2250. We have been working on an improved version of the gaiter on the Easyboot Epic, Easyboot Bare and Easyboot Grip for several months. After many tweaks and miles of testing the gaiter is now complete and will be shipping on boots starting February 2008. 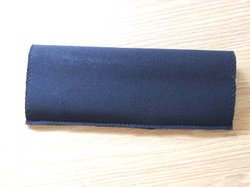 All provisional patent work is complete and we will be sending new gaiters to Team Easyboot Members in the near future.